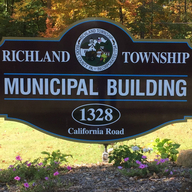 Richland Township, Bucks County, Pennsylvania has set up this channel to broadcast our monthly public meetings, especially our Board of Supervisor’s meetings. The Board of Supervisor’s Meetings are held on the second Monday of each month at 7:00pm. Other meetings we will add in the future will include our Zoning Hearing Board and Planning Commission meetings.